Yes, You Guessed It . . . The stage was set for me to think I had gained control of these boisterous dogs and could handle another one as a foster mom. I wanted to help other dogs find loving homes and thought I could take a rescue Border into my home, soften some of the rough edges, provide initial training. I called a friend at the wonderful local shelter – run by Sammie’s Friends – and asked if there were any male Border’s needing foster homes (Prinny would not tolerate a female). When one came in, I went down to assess him for fit. But that guy was way too aggressive: on our way out for a walk, he lunged at another dog in the last kennel. Uh Oh! 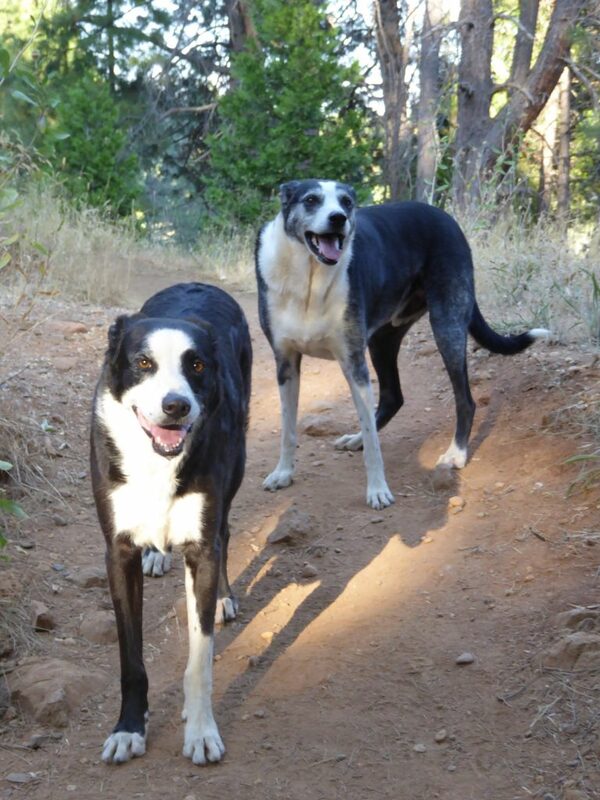 The dog he lunged at was gorgeous – a long tall sleek Border Collie/Whippet mix. Turns out Border is just the coloring – a classic bait-and-switch technique. He’s much more scent hound. Yes, I fostered him for a whole week, then just adopted him. His bad behavior started the moment I signed the papers. Oh, and he’s part klutz, too – in the first year, he had 7 surgeries for injuries sustained running like a wild hurricane. 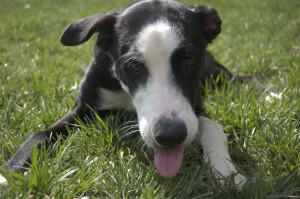 I named him Tuxedo at the suggestion of a friend – and “Tux” is far from the perfect dog or perfect fit for us, but I am obviously crazy anyway, right? At first, the progress was slow and ragged. 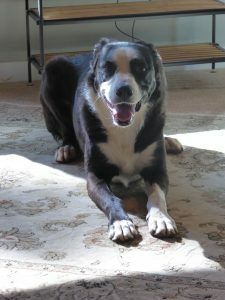 Tux was a strong-willed, extremely fast, and very energetic dog the first several years. I should have named him “Whirlwind.” He was easily stimulated by just about anything that moves, so it took quite a bit of training (yes, even negative or corrective) to get him to mind. Add to that his absolutely overwhelming desire to meet and play with every dog or human, adult, or child – he was so gregarious it can frighten strangers. I took him to a behavior class agility training. When agility stopped for the winter, other bad behaviors have emerged. One by one we eliminated them. And like every other dog I’ve ever loved, he’s worth it . . . and Tuxedo has aged gracefully into a very sweet well-mannered and nearly perfect dog. He’s quite a bit older now, but still walks about 5 miles a day with me! 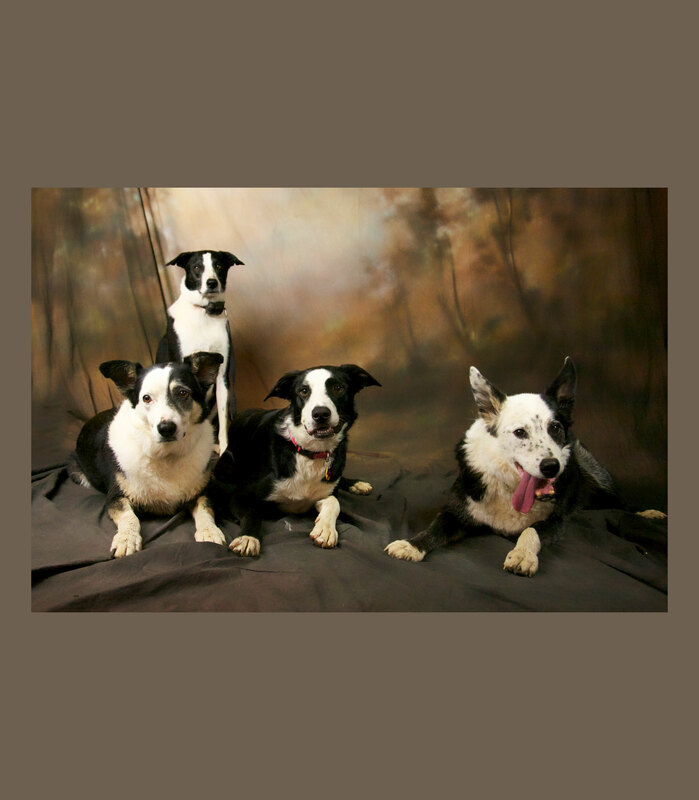 Oreo – a McNab Border Collie, who is as intense as Sparky was but very eager to please and not nearly as strong willed – ended up in the shelter (Sammie’s Friends). She reacted with a scary snarl when I first approached her in her kennel – the same initial reaction she displayed for the trainer at the shelter (Beverley). But the minute I started talking to her and offered her a treat, she became very sweet and obedient and unafraid – just as she had with Beverley. I learned that she had originally come to the shelter from a family of 7 kids. Judging by the tall, thin, male people she was most afraid of, I concluded a young boy had teased her enough to make her fearful. I subsequently got very attached to Oreo while helping train at the shelter, but since I already had 3 dogs, I had to find her another home. I got an acquaintance interested in her, and they adopted very quickly. They didn’t quite know how to deal with her fear of people; they returned her to the shelter after 3 months – on New Years Eve 2010. Knowing how much I cared, Sammie’s called me and I came in to get her, just as a foster. Then a week in, a potential adopter – who had a couple of kids – called. Because of the kids, I made the snap decision that I was keeping her: I did not want her to fail in another home. So now I had 4 dogs! Over time, at least a hundred nice strangers would let me touch their arm and hand them a treat to give Oreo while we walked on the various NID ditches in the area. That gradually assured her that no one meant her harm. Then suddenly, several months after I adopted her, she was no longer afraid; in the several years since, she has only twice duplicated the fearful crouch/harsh barking that she had originally displayed. Since that was the only “bad” behavior she ever had, and it was eliminated fairly easily, she’s been the best dog I’ve ever had! A fun note: I had introduced (accidentally) the word “SQUIRREL” when she was still a pup, and her reaction had developed into a funny display: she’d run to the nearest tree and try to chop it down with her teeth, growling all the while. I’d sometimes use that technique when people approached, just to distract her from.I did it often enough that she drew the very logical (dog wise) conclusion that people bring squirrels with them! Now, she runs up to approaching people in a very friendly fashion, but instead of greeting them and waiting for pets, she turns to look expectantly at me, waiting for me to say “Squirrel” in my squeaky voice. Depending on the people and their curiosity or interest, I do, and everybody gets a laugh! 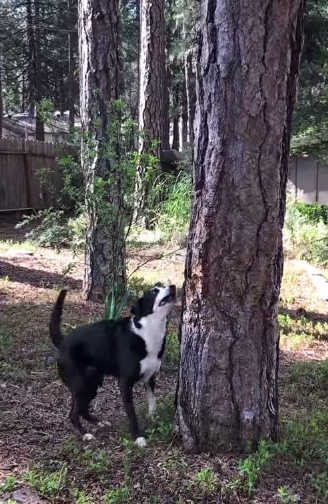 (And no, it won’t hurt the trees or her teeth – and she’s never caught a squirrel or chopped down a tree with her teeth!) See the video of that here. Addendum: Sparky passed away 2013 (See more pics here), Prinny in 2014. With only Tux and Oreo at home, I still occasionally foster, and find it very rewarding to find the fosters their forever homes!